Upton Sinclair was an American author, very popular in the early 20th Century. He was a Progressive, after the mold of many, such as Wilson, Jack Reed (assisted Lenin and the Bolsheviks-he is buried on Red Square), Margaret Sanger, etc. of that era, and founded the California chapter of the ACLU. It is with that as a backdrop I make the following comments, related to this meme of Bernie Sanders, self declared Democratic Socialist. I submit to you that the Progressive and “Social Justice Warrior” rhetoric against “old, white, misogynistic, chauvanistic and racist men” has more to do with marginalizing opposition and advancing the Democratic Socialist ideology than any of the aforementioned disparaging accusations. You don’t get any older, or whiter, or manly (ok, maybe more manly) than Bernie. But hey, I give Bernie kudos for having the cajones to wear the brand! If that’s not concerning enough, think of it this way: The Democratic Socialist candidate got 63% of that voting block compared to Hillary’s 37%. Worried yet? Wait there’s more! 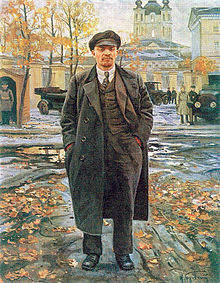 Vladimir Lenin was vaulted to power by the Bolsheviks in 1917 Russia. Lenin called himself a Democratic Socialist, and their party was the “Socialist Democratic Labor Party”. Lenin said, “Communism is the end of Socialism”, or perhaps more generally translated, “The goal of Socialism is Communism”. The declared enemy of the Socialist Democrats is the “Bourgeoisie”, the Middle Class, those Capitalist business owners who own the greater percentage of wealth, both then and now. The following video is simply THE BEST 10 minutes spent by ANYONE who wants to know what is unique about America, is even the slightest bit interested in American History, or just needs to be educated on the issue. This video showed up on my Facebook feed, and actually has a “Warning” screen covering it, giving the impression there is some vile or offensive content that people may not want to see. Well, it may be offensive to those who want the American People to remain ignorant of their own history, and continue in the current progression toward an Oligarchical system. We’ve already seen, just in the last 20 years, and more specifically in the previous administration, how anarchism is used to initiate the “democracy” minded agents (better known as “the mob”, or as Lenin called them, “Useful Idiots”) to then demand the further exchange of power to the Oligarchy. This is an excellent tool that perfectly destroys confusion and misconceptions about who the “Right” and the “Left” really are, and the accurate differences. Throughout history, those who seek to destroy must demonize their opposition. This has been successfully orchestrated in the United States by using media, academia, and bureaucracy to indoctrinate, embarrass and manipulate the gullible masses. Please, take a few minutes, watch it and then share it! Identity Politics is the result of abandoning Truth. When I started writing this commentary, I was going to begin with the premise that Identity Politics was the cause of Moral Equivocation and application of double, or multiple standards, but quickly realized that, no, Identity Politics is the result, not the cause of application of “relative truth”. Truth cannot be relative, but must be held as absolute. Some philosophers have, for centuries, attempted to blur the lines of Good and Evil by questioning truth, as relative, pragmatic, or even plural. This is nothing new. But societies and civilizations rise and fall on the understanding and application of Truth. Why? Because Truth is the basis for Good and Evil. Understanding Good and Evil is prerequisite for a civil and just society. Mankind has temporarily run into this understanding occasionally throughout history, but it generally does not tend to hold through for multiple generations. For 50 years we have toyed with Relativism (Truth is relative to the situation-we called it “situational ethics” back in the ‘70’s), and found that we preferred to embrace Pluralism (wherein everything is true, and all philosophies, cultures, ideologies, and religions are of equal value). Pluralism has castrated the minds of Americans and Europeans (culturally and socially) preventing a thought process based upon the fundamental idea of Truth, which brings the understanding of Good and Evil. If Evil does not exist, then what is Good? Who defines it? If there is no difference then Mother Theresa and Adolph Hitler are equal, and share the same eternity. See where that leads? It leads the Epicurean, (who is always questioning Truth) Pontius Pilate, to look Jesus Christ Himself in the face and ask, “What is Truth”? Absent of Truth, then “every man does that which is right in his own eyes.” We then gather with those who share the same “truth” as we, so as to justify our position, and point out how “morally corrupt” our opposition is, based on the false premise that we, do indeed, hold the moral high ground. With no fundamental truths to direct or stay our emotional whims, we have then become victims of our own emotional reaction. The society who does this is ripe for the picking. Either by an outside force, or by an opportunistic individual from within. By adopting Pluralism, we have tried to embrace everything as of equal value; by embracing everything, we hold on to nothing. This is not a political commentary. It is a call to repentance. Without God there is no Truth. No Understanding. No Purpose. NO Future. No Hope. Jesus Christ embodies all this. And that’s my sermon for today. If you haven’t read Saul Alinsky’s “Rules for Radicals” by now, you won’t understand what is happening in America. Professor Barack Obama, our past Chief Community Organizer, taught Alinsky’s methods to his students and promoted them in the White House. Candidate Hillary Clinton did her college thesis on him. Alinsky’s fundamental premise is found on page 116. America stands at the most pivotal point in her history since the Kansas-Nebraska Act (which resulted in the Civil War). We are polarized. We are factionalized. Our history has been rewritten to minimize the importance of our Judeo-Christian foundation. Our institutions have been purged of morality that comes from that foundation. Our language is adulterated with vulgarities which are most commonplace in our youth. Our youth have been hijacked by powers that redefine what family is, strip them of any faith in God that was instilled as a child, and replaced with the collectivist philosophy, “from each according to ability, to each according to need”. That’s Karl Marx, by the way. It’s also most of the leadership in the current American Democratic Party, some unions, our education system, the media, and yes, it’s beginning to take root in the Republican ranks as well. This did not begin with Barack Obama, and it will not end now that he is out of office. The Revolutionaries now have a personified objective, a target to rally the followers, most of which are unwitting (Lenin’s term was “Polyezniys” or useful idiots), in Donald Trump. Vehement protests, fear-mongering, political stonewalling and talk of impeachment within the first 6 months is a harbinger for the next four years, unless the unthinkable were to happen, (i.e JFK), and don’t think it is not being discussed in the ranks of the revolution. Tragically, it doesn’t matter what President Trump does now. The narrative is in – Conservatives are Racist. One moron who agreed with a small racist organization, which unfortunately for the vast majority of the Right has been successfully cast in the media as representative of the whole, has committed a terrorist act killing someone, and now the entirety of American conservatives who believe in small government, personal responsibility, and the Constitution, are “responsible” and the President they elected is as responsible as the driver of the car. Are those same voices on the Left- those screaming that Trump is the culprit and responsible for all the polarization in the country- are they willing to own Ferguson? Boston? Dallas? BLM and Antifa? Not riot, not block traffic and burn buildings, or run a car into a crowd of people! I don’t agree with most of these groups, but I don’t have the right to shut them down, just as they don’t have the right to shut me down! But that effort is well under way! Make your stupid statement of what ever your special interest is. I reserve the right to oppose you by arguing my point of view without you shutting me down. If I can’t make a coherent and logical argument as to why you’re wrong, that’s on me. I don’t have the right to violate your person and throw a rock at your empty head! If you are offended by my sign, too bad. If I protest according to the law by obtaining the proper permit to assemble (now there’s a paradox), and you rally a protest against me without the same, who is usurping the law? But these things don’t matter. All that matters is chaos. Division. Polarization. Advance the revolution. Identity Politics. Trump isn’t their target. Americanism is the target. Racism isn’t the target. Inequality isn’t the target. Truth is definitely not the objective. But it doesn’t matter. It’s very simple. Divide and Conquer. As Saul Alinsky said, “The issue is never the issue; the issue is always the Revolution“. There is blood in the water, and the frenzy has begun. This post was originally published in 2012 by the title “The Coming Revolution”. Updates have been added where appropriate. George was not to be found in 2016 either. However, the candidate chosen was definitely not in the mold of the sitting President, or any preceding for that matter, and a result of a cumulative effort by media, an embedded Leftist agenda in government, education, and party elites continuing the move toward collectivism in the United States of America. But do not be mistaken. This movement is not about race. It is pure ideology. Without a victim class, real or perceived, revolutions can’t get off the ground, and if victims cannot be found, they will be produced. In 2015 the revolution moved to the university campus. Disruptions occurred in a highly organized manner at most major colleges, all with the same theme of “social justice”, removal of law enforcement, and other demands including the suppression of open debate. Freedom of speech died on the American college campus. While the movement is reminiscent of the 1960’s-70’s radical revolutionary movement which paralleled, then infiltrated and co-opted a legitimate civil rights movement, this is even more serious, more deadly, and more dangerous than that. More dangerous in that the radicals have been allowed to infiltrate every institution, and are now in the chief seats of power. More serious because during the 50’s and 60’s there was legitimate need for civil rights reform in both American society and in government. More deadly in that the stability of American society has been successfully fragmented over the last 40 years due to multiculturalism and pluralism, and with unchecked immigration policies over the last few years. The great “melting pot” of American culture has become a TV dinner, divided, cold, and hardened to critical thinking and introspection, and identity politics rules the day. History proved the Bolsheviks to be mere pawns in the eventuality of Stalin’s rise to power against even Lenin’s wishes, and many of them perished in Stalin’s “purges”. There is an ideology that has been around in America for a long time now, but has never had the momentum and support from our institutions that it currently enjoys. That ideology is collectivism. It has existed in varying degrees around the world in political movements like socialism, communism, and fascism. In its mild form it opposes capitalism, seeks to redistribute wealth, limit private property ownership, all through government regulation. (“Social Justice” is another term that is frequently used by collectivists.) This is “social democracy”. We are becoming very close to that now, if not already there. Collectivism always puts the group needs before the needs/rights of the individual. The ultimate in a secular collectivist society is Communism, where the government owns or controls everything from food production to education. It manages information flow through news media, the arts, and academia. The duty of each citizen is to the state. The natural result of this philosophy is the weak perish, and the middle class disappears. The ultimate goal of total equality is nearly met, and for all the rhetoric of “social justice”, well…everyone lives in poverty except the ruling elite. Islam is another collectivist society in which the rights/needs of the individual are not important, but demands each citizen serve the collective in order to maintain it. The only practical difference between Islam and Communism is that Islam is a theocracy, in which all aspects of life and society are controlled by the ideology, dispensed upon the collective, by the collective, if a theocratic government is not available. This is why Islam has allied itself with the American Left, a curious alliance indeed. Again, the middle class is virtually none existent, while the ruling elite prosper. America has always been about the Liberty of Mankind to choose his own destiny, his responsibility to his God, and his duty to preserve these things for his descendants and his fellow citizens. It has proven that the success of the collective depends upon the liberty of the individual. When the individual is allowed to prosper and flourish, the community prospers together. That was the difference between the early Colonies of Jamestown and Plymouth. Jamestown had been a “collectivist” or communal endeavor in which all property was held in common and all needs came from the common purse, or storehouse. This leads to the “freeloaders” who contribute little or nothing and consume as much as everyone else. Jamestown died. Plymouth began as such but William Bradford recognized the flawed system and allotted a parcel of land to each family to provide for their own needs and any surplus could be sold or given to a neighbor. Capitalism. It is commonly misunderstood among the “Social Justice” crowd and many average Americans, that charity is squelched by capitalism. Quite the contrary, capitalism begets charity, especially when the prosperous citizen believes in his Creator and therefore has a sense of duty to his fellow-man which always results in a higher rate of contribution to community than an over reaching government taking from the prosperous and “redistributing the wealth” because the government requires its cut for inefficient administrative bureaucracy. An authoritarian government can never create a benevolent citizenry. It can only dispossess its citizens to meet its own needs. A benevolent citizenry is created by allowing that society to prosper from within, to the point of plenty, when then by the dictates of conscience, not government, each person may choose charity, thereby raising the standard of living for all. William Bradford proved it out. The argument could easily be made that “Godless Capitalism” is evil. I would not disagree; but would remind you that “Godless anything” is evil, including Godless Government, Godless Politicians, Godless Education, Godless Finance, and Godless Media. But the striking thing here is this: Those who are decrying the evils of “Godless Capitalism” are of the very persuasion that ejected God from our institutions!! America stands at the most pivotal point in her history since the Kansas-Nebraska Act (which resulted in the Civil War). We are polarized. We are factionalized. Our history has been rewritten to minimize the importance of our Judeo-Christian foundation. Our institutions have been purged of morality that comes from that foundation. Our language is adulterated with vulgarities which are most commonplace in our youth. Our youth have been hijacked by powers that redefine what family is and strip them of any faith in God that was instilled as a child, and replaced with a collectivist philosophy, “from each according to ability, to each according to need”. That’s Karl Marx, by the way. It’s also most of the leadership in the current American Democrat Party, unions, our education system, and the media, and yes, it’s beginning to take root in the Republican ranks as well. Even if they were to be successful in removing Mr. Trump from the White House, Mike Pence, a true conservative and a highly principled man, would make an excellent President, but the Revolutionaries won’t like his policies any better than Trump’s. They haven’t stopped to consider that, but it doesn’t matter. As Alinsky said, “The issue is never the issue; the issue is always the Revolution“. There is blood in the water, and the frenzy has begun. Yes, Mr. Obama, I believe you have “fundamentally transformed America”. Made good on that campaign promise. But you can’t take all the credit yourself. It’s been in the works for a long time. The Historic lesson? Collectivist revolutions always take you farther than you want to go. The Spiritual lesson? Godless revolutions always lead straight to Hell…. My lawyer friends tend to agree that Trump’s EO placing the MORATORIUM on the refugee program from only 7 of the 56 Muslim nations will stand in the Supreme Court. Obviously since there are 49 other Muslim countries not included on the list affected, it is NOT a “Muslim Ban”. Just as obvious is the fact that the order is only temporary – thus doesn’t qualify as a “BAN” on anything. According to the Federal Statute passed by Congress in 1952 (8 U.S.C. §1182(f)) Congress has given that authority to the Executive. You can find both the statute and the EO anywhere on the net, and yes I have read them both. The United States of America has been the most welcoming and hospitable recipient of immigrants in the world, and has been the “Shining City on a Hill” that the entire world has looked to as the apex of freedom and prosperity, and the most desired country in the world to immigrate to. Millions have successfully sought new opportunity and liberty on her shores, and yes, have thrived and multiplied. There is also the painful truth that not everyone got through Ellis Island, due to various reasons, but all in the spirit of self-preservation, whether a security risk, disease or character history. There is no natural “right” to the rest of the world to live here. America is not obligated to take everyone and anyone who wishes to migrate here, nor is any other sovereign nation obligated to do such. If you don’t think so, just fly to any country in the world, get off the plane and say “Hi, I am your new neighbor. I will be living here now.” Yet, America has always been the most benevolent of all. America does not owe the rest of the world anything but to preserve itself as a refuge for those who seek liberty and equality under the law. When the land behind the great statue looks like the rest of the world, to where will those “huddled masses” flee? Activist Judges continue to annul the law in favor of a political ideology. If the Law does not apply to those who make it, or those who interpret it and enforce it, then why will the people adhere to it? If the Law only applies to some of the People, how long will any of them be contained by it? What incentive is there for those who are constrained by the Law to remain submitted unto it? Have the conspiracy theorists been right all along and we now live under Oligarchy? Perhaps we now repeat the Old Testament time of the Judges when “every man did that which was right in his own eyes”. Is the founding principle of “all equal under the Law”, just a passe’ byline? Maybe Orwell was right – “All animals are equal, but some are more equal than others”. Either America is a nation of laws or we aren’t. If we abandon the rule of law, you can stick a fork in the Statue of Liberty. Mrs. Obama said she had “no hope” now that Trump was elected. Millions of snowflakes are bereft that Hillary did not win the election. Many people are so lost in their grief they’ve had to get therapy, join “safe rooms” and drink hot chocolate while petting puppies to give them solace at the loss of the election. Many more are so angry they’re going to actively join in attempts to sabotage the new President, and a lot of these people represent around 90% of the media, many are in elected positions, many more are un-elected bureaucrats, and some are going to be causing havoc in the streets. Many on social media are lamenting they “no longer have a leader”, refuse to accept the new President as legitimate (failing to understand the electoral system which balances elective power), or simply refuse to accept him as President b/c Hillary lost. I’ve seen talk of impeachment, even before Trump has been inaugurated. Good luck with that. But I would be perfectly happy with a true conservative, Mike Pence in the Oval Office anyway. You won’t like him. For those who are so lost and anxious without a “leader/provider”, if the person in the Oval Office is where you find your confidence, your strength, your security and self worth or identity, you have appropriated your faith hope in a power/figure who can do nothing to make you a better person, improve your standing in your community or provide real sustenance for your children or make them better people when they grow up. The only person who can do that is you. Maybe it’s time everyone started a little self reliance program and quit waiting for government to “fix it”. When you place all your hopes and securities in one man, I don’t care who he is, you are following the crowds who empowered every dictator in history. If your happiness, your self esteem, your security in life, is dependent on that special someone in the White House, you are pathetic. Time to get on with life. Definitely do not turn a blind eye to government, but face the facts, just like I and millions of fellow conservatives faced the fact that Obama won, not once, but twice. Confession: I flew my flag at half mast after Obama won the second time for 3 days. During that time I still went to work, did my job, and loved my family and friends. No, I didn’t curl up in a ball and cry, or start planning a rebellion, join a riot, organize a protest at the inauguration, threaten to move to Canada, or tell the world how ashamed I was that America had elected a Marxist. Even after 4 years of proving that he was facilitating Muslim Brotherhood advancement in our own government, and abroad, had ceased indictments of co-conspirators in the largest Islamic terrorism trial in American history, and castrated our Counter Terrorism operations, I still wasn’t “hopeless”, as Mrs. Obama described herself to Oprah Winfrey. My Hope is placed in the Christ. Not a man, not a political system. Not even in the American People. No greater mistake can be made than to place our great hope and trust in any single man/woman, all of whom are corrupt, sinful and whose “heart is deceitful and desperately wicked’. I actually heard Mr. Obama referred to during his campaign as “savior”, the great “Hope” (his own campaign poster), and supporters of his celebrating that the gas tank would be full, won’t have to worry about paying their bills, because Obama would take care of them. We are witnessing the disintegration of America as we have known it. We’ve been divided and subdivided for ease of conquest. We are disunited, angry, and polarized like no time since prior to the Civil War. I believe it is the natural progression of any society who rejects truth, visa vi, Biblical Christianity. We are less educated than indoctrinated, less informed than misinformed, and less circumspect than disrespectful, except of those we find who agree with us. We have been “Community Organized”. Read Saul Alinsky’s “Rules for Radicals” to understand what that means. To quote Alinsky, the “community organizer is an agitator”, who takes advantage of divisions and differences among people to completely separate them from traditional views, beliefs, or practices which unify society in general, in order to remake that society. It’s Karl Marx with a hint of Vlad Lenin. How has this happened? While visiting my daughter and her husband who now live in the Dallas Metro area, I made an observation, the truth of which I knew cerebrally, but now realized tangibly. Urbanization. I grew up in a tiny rural Kansas town some cultures would call a village, of 161 people. That’s inside the city limits in 1976. (The surrounding farmers and ranchers also take part in the community) I knew the population count because my grandmother and I took the census from her dining table. We knew everyone who lived there. Yes, everyone knew your business, but everyone also knew when you needed help. It is still that way; a very strong community who takes care of its elders, celebrates their neighbors joys in life and mourns their sorrows, work together and for each other, and exercises individual liberties to the extent the law will allow, yet knows the true sense of “Community” where all hold dear that sense of responsibility for the common good, but the importance of individualism. It’s not heaven, but it’s closer than Dallas. Humans possess an innate desire to be part of something bigger than themselves. God placed this intrinsic need within us for our own survival, and more importantly to draw us to Him. Like all God given human desires, when perverted they become destructive, both physically and spiritually. Where there is little or no sense of community, i.e. big cities, there is still that need to belong. You don’t see gangs roaming the streets of Podunk, USA. You don’t find Union halls in Smallville. Per capita fewer will belong to Kiwanis or Lions in Omaha than in North Platte. That’s why racially driven revolutionary organizations do better in Houston than in Lubbock. “Community”, like many terms in our American lexicon, has been redefined to represent those who look like you, or hold the same ideology. The classic sense of community, although still thriving in those rural settings, has for the most part gone by the wayside. This, I think, is the crux of the issue. We have thrown off our Judeo-Christian moorings, both individually and socially. It is a vicious cycle. I don’t have the answers, I am just making observations. Perhaps this is the natural evolution of society; a reflection of the spiritual condition of mankind which, when concentrated, reveals the true level of depravity. Recall Babylon. Perhaps we should be prepared to be scattered.